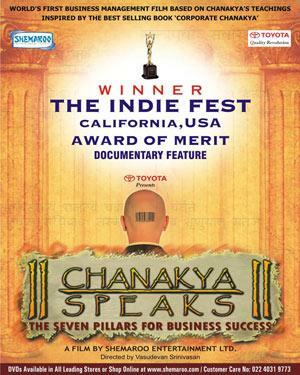 The Film "Chanakya Speaks-The Seven Pillars for Business Success" is the story about the quest of a young business executive trying to learn from Chanakya's Teachings. He discovers Chanakya's Seven Pillars Construct and sets upon the journey to adapt it for the growth of his organization and his life. In the process he also meets some 'real - life' successful leaders of India's biggest companies. He understands, that what the leaders tell him and what Chanakya said centuries ago are not different. He begins to create a new direction for himself and for his company. Original Chanakya Speaks - The Seven Pillars for Business Success DVD released by SHEMAROO comes in 1 disk DVD pack. While processing the order, we bubble wrap the DVD in its original packing and send it in sealed plastic or carton pack. We don't offer download of the Non-film Chanakya Speaks - The Seven Pillars for Business Success, nor we send free poster of the Non-film along with its DVD order. We also don't offer free wallpaper or song download of the Non-film. Poster and other accessories of the Non-film can be purchased separately. Buy Hindi DVD Chanakya Speaks - The Seven Pillars for Business Success and watch them at the comfort Of your own home. Online shopping Chanakya Speaks - The Seven Pillars for Business Success DVD, Buy Chanakya Speaks - The Seven Pillars for Business Success DVD, purchase original Hindi DVD of Chanakya Speaks - The Seven Pillars for Business Success. Online store to buy Chanakya Speaks - The Seven Pillars for Business Success DVD	, online DVD store india, buy Hindi DVD, watch Hindi movie Chanakya Speaks - The Seven Pillars for Business Success videos online. We don't offer DVD renting for Hindi movies online, Buy Original Chanakya Speaks - The Seven Pillars for Business Success DVD @ discounted and cheapest price online in India.